Conducted by Laurence Equilbey and featuring the renowned Accentus choir and Orchestre de Chambre de Paris, this new recording of one of the French masterpieces of the mid-19th century is a real discovery. 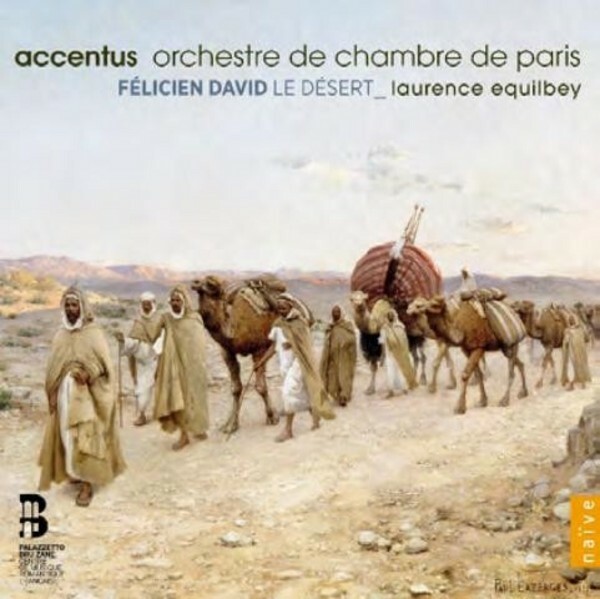 French composer F�licien David spent 4 years in Egypt and Algeria before returning to Paris, where he composed this romantic 'ode symphonie' which pandered to the popular orientalist trend and was a huge success throughout Europe. Born in 1810, F�licien David's voyage took him to Egypt and Algeria between 1831 and 1835. He returned to his homeland with the intention of �singing of the East� to French ears and making a name for himself as a composer in Paris - at that time, the musical crossroads of Europe. In December 1844, David reached the heights of fame when his ode-symphonie 'Le D�sert' was performed at the Th��tre-Italien. Berlioz extended an enthusiastic welcome to the work, in which he saw the reflection of his own aesthetic experiments, and in February 1845 he conducted 'Le D�sert' himself in a concert at the Cirque des Champs-�lysees. Berlioz had tried his hand at a mixed genre with 'Rom�o et Juliette' in 1839, namely the �symphonie dramatique�, midway between the oratorio and the symphony, but in 1844 David ushered in a new manner of conceiving the narrative: he does not project his listeners into the heart of a frenetic action, but rather asks them to observe a landscape, as if they were standing in front of three successive tableaux - a caravan advancing; a nocturnal halt; a sunrise. This phenomenal success, however, such as Berlioz was never to enjoy in his lifetime, had a detrimental effect on David�s future career. The reception of the oratorio 'Mo�se au Sinai' (March 1846) already suffered from this factor, and the composer of 'Le Saphir' (premiered at the Op�ra Comique in 1865) was even reproached for having �got off his camel�. In Le Monde, July 1868, a caricature by the cartoonist Achille Lemont depicted an ageing F�licien David holding a lyre with broken strings, seated on the skeleton of a camel and chained to a post bearing the inscription �D�sert a perp�tuit�.